It was a morning of bright smiles and rhythmical movement as LYA's youngest stars performed for their parents, grandparents and friends during their graduation. Early Childhood Director, Lilia Luzhanskiy and her staff did an amazing job preparing the children for their outstanding performance. The children performed dances, sang songs and were even part of an orchestra. They impressed the crowd with their use of ribbon wands and rhythm sticks. The performance ended with a lovely Hinai Matov, to illustrate how happy they were to work together this year. The highlight of the event was the certificate ceremony. 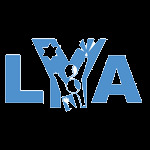 Rabbi Noach Kosofsky, enjoyed presenting everyone of LYA's young stars with a hug, a high five and a big smile. LYA is very proud of the childrens' achievement and growth this year. Yasher Koach.